International buyers: we can connect you to the best coffee growers in the country. USA-based coffee vendors: we can help you build a social-business approach to boost your sales of Rwandan coffee by telling the story of the Batwa pygmies. Coffee-Drinkers: we can set you up with your own awesome, personalized Rwandan coffee. Coffee Rwanda is a "social business": we are all about the health, education and welfare of impoverished families who survive on a less than a dollar a day in one of the least-developed nations on earth. For our first 10 years, Coffee Rwanda sold coffee online, and in 2019, we'll transition to become your go-to source of connections to the world of Rwandan Coffee. 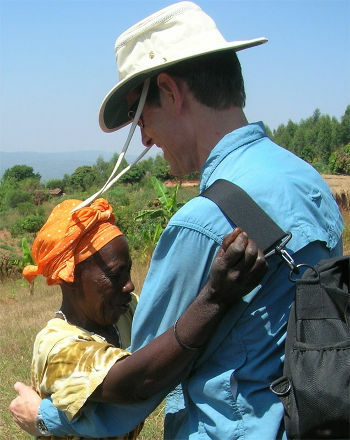 Coffee Rwanda was formed when the founder, Karl Weyrauch, along with his wife Patricia Boiko and their daughter Anna, visited Rwanda to teach Public Health to the staff of Never Again Rwanda, a local non-profit. Through a roundabout series of coincidences, they found themselves at COOPAC, a Fair Trade coffee cooperative near Lake Kivu. Karl offered to bring coffee samples back to Seattle and thus was born his interest in Rwandan coffee: as a vehicle for nation building in the aftermath of genocide. By helping to combat poverty among its 2198 member farmers, COOPAC greatly improves their health as well. Another amazing thing about COOPAC is that it literally serves to help heal the wounds of the 1994 genocide, made known to American audiences in the film, "Hotel Rwanda". Women sort the beans by hand and as they do, they talk - building relationships between the genocide killers and the surviving victims - a meaningful and sustainable avenue for reconciliation. Interestingly, COOPAC includes among its members individuals of the Community of Potters (formerly known as the Batwa pygmies), a marginalized minority inside Rwanda. Expanding on this beginning, Karl and his friends started the US-based non-profit Pygmy Survival Alliance to apply all profits from the sales of Coffee Rwanda to improve the survival and welfare of these, the poorest people in Rwanda: both those who have been "left behind by history" and their neighbors. As they say in the language Kinyarwanda: "Murakoze cyane!" You can help make a difference. We rely on an international team of talented, passionate volunteers to make this work happen, ensuring that all profits, after expenses, can be donated for the reconstruction and development of Rwanda, through our non-profit Pygmy Survival Alliance. No other coffee company can say the same. We are available for educational presentations to schools, churches, community groups, professional organizations and other interested parties. You too, can help make a difference!